Romania bears the image of ancient architecture contrasted against a backdrop of vividly green landscape, with features that have remained largely undeveloped. Numerous mountain, valley, and lakeside resorts offer an abundance of activities. Many of the country's impressive collection of ancient ruins, prehistoric fortresses, and medieval castles date back to prehistoric times. You’ll see hints of this as well as influences of the Ottoman Empire and Austro-Hungarian rule apparent in preserved details. Tourism in Romania is not as prevalent as other countries, which makes the travel experience here feel more authentic and awe-inspiring. Check out this simple-but-captivating country and discover its natural and historic beauty on a Romania holiday. Transylvania: Popularly known as the home of Dracula, this region is actually a cultural hub filled with Romania tourist attractions and outdoor adventure opportunities like hiking, skiing, and rock climbing, plus it features some of the oldest and best-preserved medieval towns in the country. Northwest Romania: This region hosts wild, untouched nature and secluded villages with very few tourism conveniences. Southern Romania: Whether you enjoy architecture or skiing, the southern region of the country lays claim to both, with old castles and towers set among the Bucegi Mountains, a skiing and hiking paradise. Southeast Romania: The southeastern region draws tourists with its beautiful sandy beaches and warm waters of the Black Sea, but you'll find churches, fortresses, and castles dotted throughout the hills as well. Western Romania: With large undeveloped areas, this region is off the beaten path yet still offers fascinating historical ruins and structures along with Timisoara, the area's main city characterized by colorful townhouses and festivals. Bucharest: Nicknamed "Little Paris," the capital city surges with old and modern architecture characterized by a strong French influence, including the Palace of the Parliament--the second largest building in the world. Brasov: With a central location near the Carpathian Mountains, the city serves as a jumping-off point for hikers and skiers interspersed with the local flavor of bohemian cafes and restaurants. Sibiu: History and culture draw tourists to Sibiu, where the Germanic style inherited from past residents mixes with modern architecture and colorful festivals. Sinaia: This mountain resort, named after the on-site monastery, serves as a popular vacation spot for both locals and tourists alike and provides a base for skiing and hiking activities. Cluj-Napoca: The multicultural capital of Transylvania harbors a relaxed, friendly atmosphere and is filled with attractions like churches, museums, squares, and more. Sighisoara: Known for its Old Town that's entirely surrounded by city walls, this World Heritage Site city is rich with medieval history and historical buildings in the heart of Transylvania. Constanta: Visited for its beaches and relaxed seaside atmosphere, this city on the edge of the Black Sea holds Romania's most important port as well as great nightlife. Timisoara: Serving as a good home base for exploring western Romania, this beautiful-yet-cozy city bustles with busy squares, lush parks, and blooming gardens. Bran Castle: Built in the 14th century, the castle once served as the home of Vlad the Impaler, who inspired the Dracula legend. 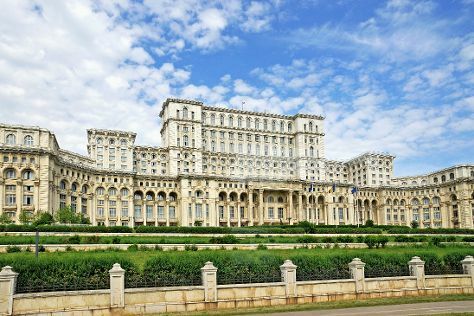 Palace of Parliament: Originally built for Nicolae Ceausescu, the palace is lavishly decorated with marble halls and grand stairways; its tour includes a display of Romanian costumes and a museum of contemporary art. Village Museum (Muzeul Satului): Experience medieval lifestyles during your Romania trip in this lakeside village recreated to imitate old peasant living conditions with folk art and craft stalls, steep-roofed homes, and watermills. Peles Castle: Built in the 19th century, the rich interior decor of this castle, with crystal chandeliers and ebony and ivory sculptures, offers many showpieces inside the 160 rooms and seven terraces. Old Town: Filled with historical and cultural significance, the Old Town boasts a mixture of architectural styles throughout its art galleries, museums, monuments, and and old sites like the Old Court Church and the National Library of Romania. Herastrau Park: This lakeside park provides a veritable playground in nature along with entertaining attractions like an open-air village museum, a royal palace, an aquarium, and many more Romania tourist attractions. Lipscani: As the old part of Bucharest, this district preserves ancient history from times before the World Wars, when Vlad the Impaler used the Princely Court and merchants frequented the area; in fact, artifacts are still being excavated today. Cismigiu Gardens: Designed in mid-19th century, the gardens provide an oasis alongside a lake landscaped and lined with statues, memorials, exotic plants, summer terraces, and a restored 1920s restaurant along with other Romania places to see. Black Church (Biserica Neagra): Constructed during the 14th and 15th centuries, this church is considered a great example of Gothic architecture and boasts vaulted ceilings, elaborate paintings, and a 4,000-piece pipe organ. Biserica Stavropoleos: Although infamously small, this church is known for its lavish choral-style decoration with carved doors and painted ceilings as well as its collection of Byzantine artifacts, like music books. Due to the country's wealth of historical sites and natural scenery, it is easy to create an enjoyable Romania itinerary with children. Transylvania attracts older kids in particular who do not mind spooky stories about Dracula, but the region is also filled with outdoor activities. In fact, most regions of Romania are rich with outdoor things to do for all ages. With its fine architecture, local amusement parks, and surrounding nature, Brasov serves as a great base for families. If you prefer the conveniences of city life, a wide range of dining options, and live shows or theater entertainment, head to Bucharest. For a family vacation on the coast, base yourself in Constanta and choose from various sandy beaches along the Black Sea. This popular Romania destination features water calm and shallow enough for easy swimming, plus you'll find sun loungers and umbrellas available for rent along the shoreline. In Brasov, bring the kids to Village Museum (Muzeul Satului) for an adventure course through the forest that includes a zipline. The waterslides and pools of the city's Paradisul Acvatic waterpark provide a fun way to cool off on warm summer days. The compact Aquarium of Constanta in Constanta offers an interactive education on Black Sea wildlife and includes displays of marine life from more distant oceans. Village Museum (Muzeul Satului) in Bucharest will transport the whole family back to medieval times as you stroll through an open-air recreation of houses, windmills, and churches while catching demonstrations from costumed staff. Do not miss the sweets shop at the entrance that sells homemade candies. Visit Bran Castle for a fascinating look at the man who inspired the legends of Dracula. Even if your kids scare easily, they can still explore the castle and let their imagination go wild with thoughts of kings and knights. Get to know Bucharest on a double-decker, open-top bus tour with a lively guide, or rent bikes and explore the city by yourself. The capital also boasts two water parks where kids can make a splash. Smoking is popular here, so restaurants may be be filled with smoke; steer clear of them if this will bother your family. But, some restaurants go as far as hiring kids' entertainers during brunch hours, like the Hard Rock Cafe in Bucharest. Many places to eat also offer kids' menus to please pickier eaters. Also ask about discounts for children at hotels, tourist attractions, and transportation services, as many offer discounts or even free entrance. If you are hoping to enjoy a date night with your honey, consider the babysitting services at some upscale hotels, many of which have been reviewed highly by other travelers. Dishes in Romania are homey and hearty, and ingredients usually include meat like pork, chicken, or lamb with fruits and vegetables. Influenced heavily by surrounding countries, the cuisine resembles a likeness to flavors from Turkey, Hungary, and Germany. Sweets like cakes and candies are popular here, so be sure to satisfy your sweet tooth during your Romania holiday. Shopping typically centers in Bucharest, and visitors looking for souvenirs or new clothes will do their best in the capital city. Urban areas offer plenty of shopping centers, supermarkets, and boutiques, but look for major shopping malls like AFI Palace Cotroceni or Plaza România for top brands. Unique souvenirs are harder to find. If you travel to any countryside villages, keep an eye out for small shops selling handcrafted goods like jewelry and clothing. First settled in 200 BC by the Dacians, the region was soon conquered by the strong Roman empire. A decade later, Romania became the first province to be abandoned by the Romans. Numerous tribes and powers invaded the nation including the Huns, Goths, and Bulgars. By the Middle Ages, two main principalities were distinguished--Moldavia and Wallachia. It was during this time Vlad the Impaler ruled. Although outsiders usually only hear of the ruler's cruel nature and terrible deeds, Vlad III is locally revered as a folk hero for his protection of the Romanians both north and south of the Danube. A significant number of Romanians moved north of the Danube to Wallachia once they recognized Vald's leadership and expert military strategy, and they settled there following his raids on the Ottomans. Some locals will tell stories, however, of Vlad's treatment of captured enemies, including impaling their bodies on poles and mounting the poles around fortifications to scare off attacks. Today Romania itineraries almost always include a trip to Vlad's home, Bran Castle. After Vlad died, the the Ottoman Empire conquered the Romanian principalities of Moldavia and Wallachia over the course of the 16th century. The principality of Transylvania fell under the jurisdiction of the Austro-Hungarian Empire. Although the Muslim Ottoman Empire permitted the practice of other faiths, conditions for observing Romanian Orthodoxy were trying. During this period, painted monasteries such as Voronet and Humor served a critical role in preserving Orthodox Christianity in Romania. Even today these monasteries remain important to national consciousness, as you'll see if you make the trip to Bucovina in Northeast Romania. Present-day eastern Romania gained independence from the Ottoman Empire in 1878 and Transylvania was granted to Romania after the dismantling of the Austro-Hungarian Empire following World War I. Initially entering the World War II on the side of Nazi Germany, a coup led by King Mihai in 1944 brought the country into the fold of the Allies. Following the war, Romania became a communist state just as its neighbors in the region did. The despotic rule of Nicolae Ceausescu saw the country transform into a police state, with the people suffering from extreme economic hardship in addition to a lack of political and human rights. Ceausescu was finally deposed in 1989, when democratic revolution swept across Eastern Europe. Romania's revolution started in Timisoara, where today Memorialul Revolutiei museum recounts the events through videos and pictures. The transition to democracy and an open market has been trying for Romania, but the country's accession to the European Union in 2007 and its slow-but-steady progress since give cause for optimism. You will never go hungry on a Romania holiday, as local tradition is to keep guests fat and happy. Expect food anytime you visit a Romanian's home. Respect is also important, and men tip their hats to women and offer their seats to women. Do not be surprised if a Romanian man kisses a woman's hand, as this is also considered respectful. Spring and summer festivals are celebrated joyously throughout the regions, so head to Brasov during the Pageant of Juni for parades and feasts that celebrate the summer solstice. If you are visiting during the winter, you may witness ringing in the new year with a parade of people dressed as goats or, in rural villages, by following a plow decorated with green leaves that is pulled through the village. Be prepared for harsh weather when planning your Romania itinerary, as the country braves very cold weather, especially in winter. Summer temperatures encourage you to wear lightweight sweaters, but from December to March winter descends and snow falls frequently. While rain is not a daily occurrence, be prepared by packing rainwear, especially when hiking in the mountains where the temperatures drop and rains can develop suddenly. Buses, trams, and trolleybuses create a reliable transportation network throughout Romania's large cities. Although Bucharest remains the nation's only city with an underground metro, getting around is still easy by purchasing bus or tram tickets at any news agent or street kiosk before boarding. Taxis are available but less common; if you use them, be sure to hail a taxi with its rates posted plainly on the door or windshield. The dominant and official language of Romania is Romanian, but you will find a smattering of other languages throughout the nation like German, Serbian, and Ukrainian. In Romania, service charges are not always included in your bill, but tips are still expected. When at restaurants, bars, or employing a taxi, it's customary to leave a 10 to 15 percent tip for good service. Avoid tipping in coins, however, as paying in change is considered offensive to some. Hotel staff, drivers, and guides also usually receive a small tip for their services.